“City of Berkeley, the water is murky” has become the latest rap on the city’s crumbling storm drain infrastructure. For nearly two decades, Berkeley’s Clean Water efforts in controlling surface water pollution have amounted to little more than a “greenwash” of meaningless phrases such as “Save the Bay”. The city’s failure to implement our urban runoff program is rooted in its longstanding resistance to adequately fund the maintenance and upkeep of our storm drain system. Berkeley has proclaimed over and over that it is “rolling out the green carpet”, but in reality, has used that carpet to cover this inconvenient truth. Our predicament is not uncommon. The San Francisco Regional Water Quality Control Board (RWQCB) has allowed this situation to continue by its lack of regulatory oversight. The RWQCB has allowed municipalities to voluntarily “comply” with our federally-mandated Clean Water Program. This has left city and county storm water programs awash in a bureaucratic quagmire with no relief in sight. From those earliest days of mud and macadam streets with their horse-drawn carriages, there have been few strategies to protect local waterways from urban runoff pollution, except for street sweeping. A century ago, sweeping was done on a very small scale with hand brooms. The principal focus was on controlling litter in commercial districts. Near the end of World War II, the city purchased its first mechanical sweeper, opening the door to a broader sweep of Berkeley. There was also a growing expectation for more than tidier streets. However, it wasn’t until late 1987 that there was a decision to make a more concerted effort to control runoff pollution. The city expanded its storm maintenance activities, including street sweeping which encompasses much of Berkeley’s flatlands. This marked the beginning of Berkeley’s Clean Water Program. However, like so many of our city’s well-intended efforts, the storm water program and its street sweeping maintenance component were derailed. In 1992, the city seduced Berkeley voters into passing its first storm water user’s tax. The new revenue was supposed to increase municipal maintenance activities such as sweeping. Despite the sell for pollution protection, it soon became apparent that Berkeley was not fully cued into its own program. Within months of the new tax, the city was cited for dumping the street sweepers’ sludge down the storm drain at its own public works yard. It was a harbinger of the mismanagement of this important environmental program. Many believe, and rightly so, that it is parking ticket revenues, and not flood control or curbing bay pollution, that drive our Clean Water efforts. Property owners were told their annual storm assessment would finance more maintenance and a progression of infrastructure upgrades. Unfortunately, this simply didn’t happen. When Berkeley transferred its existing costs of storm maintenance to this modest storm tax, the city failed to partner up with taxpayers to budget additional storm revenues from the General Fund. As a result, our NPDES permit activities, including sweeping, became permanently stunted. Since the storm water assessment has never been successfully brought back to voters for regular increases, the Clean Water Program has remained severely under-funded. Berkeley has used this to justify putting a budget cap on our federal permit activities. No wonder street sweeping has remained at 1992 service levels, and that the few infrastructure upgrades continue to be emergency driven! As a result, there is now a backlog of much-needed storm drain repairs totaling tens of millions of dollars. However, Berkeley’s Clean Water failure isn’t entirely due to budgetary shortfalls. 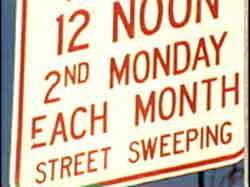 Soon after 1992, the city created a street sweeping exemption called “opt out”. Those residents who petitioned for this exemption expressed their distaste for those nasty old street signs, expensive parking tickets and the inconvenience of moving their cars three whole hours a month! As a consequence, nearly 100 streets are no longer cleaned. Criticism of this policy forced the city council to form a storm water taskforce in 1995. A year later, their report concluded that it is as costly not to sweep as to sweep because the machines have to travel over the streets that have opted out in order to get to the rest of the roadways that are still participating in the program. The council has never taken any real steps to bring the opt-out streets back on board. Instead, council members continue to rationalize that the city is doing enough for bay protection, despite its opt-out policy. Furthermore, the city has said that the number of opt-out streets is too small to be of concern. However, the hill areas of District 6 and District 8 could easily be cleaned once a month, but have never been included in the “citywide” sweeping program. Clearly, all those roads have been exempted from the storm water program, too. This cavalier attitude set the stage for Berkeley to opt out of its responsibilities to the NPDES permit and our Clean Water compliance. When will the entire city be swept? It should be noted that Assemblywoman Loni Hancock was mayor of Berkeley when the opt-out program was created. She helped set the course for the city’s poor performance in the regional storm water program. Recently, Hancock has been campaigning for bond money to solve the many serious storm water problems. Hopefully the lessons of the past will teach her that the Urban Clean Water Program needs more than just money to affect a real fix. This week, the San Francisco Regional Water Quality Control Board is meeting in Oakland to receive public comments on our bankrupt storm water program. Unfortunately, this discussion is too little and certainly too late. The Water Board needed to exercise its regulatory powers fifteen years ago. Their unwillingness to aggressively require compliance is the main cause for the failure of the Clean Water Program throughout the entire San Francisco Basin! The choices made by the Water Board at the onset of the program have created the lowest possible standards for protection of our state water resources. Our city’s half-hearted efforts have been reduced to little more than a paper shuffle of quarterly reports. It is criminal that Berkeley and the other county permit holders have been allowed to default for all these years on so many crucial Clean Water activities.